Benjamin Taylor leads the remaining 102-players in the WSOP-C UK Main Event. See who else is through, here. Only 102 players remain in the 2019 World Series Of Poker Circuit (WSOP-C) UK Main Event and nobody has more chips than Benjamin Taylor who returns to the action armed with more than 200 big blinds in his arsenal. Day 2 began with 388 players returning to their seats, all knowing only 119 of them would be heading home with some prize money to show for their efforts in the £1 million guaranteed tournament. Plenty of established professionals fell by the wayside before the money bubble burst, including Steven Warburton, Jason Wheeler, Rupinder Bedi, Leo McClean, Yiannis Liperis, Roberto Romanello, Mitch Johnson, Sylvia Hewitt, Steve Watts and Kuljinder Sidhu. The money bubble dragged on for what seemed like an age; it was so long that the tournament director reduced the number of levels played from 10 to nine. It eventually popped when David Pustula and Wayne Lee busted during the same hand, although on different tables, so they shared a min-cash of £2,250. With the bubble burst, players such as Phillip Huxley, Jack Allen, and Dean Hutchison crashed out before the curtain came down on proceedings. It is now Taylor that is in pole position to get his hands on the £155,000 first-place prize and a coveted WSOP Circuit ring. 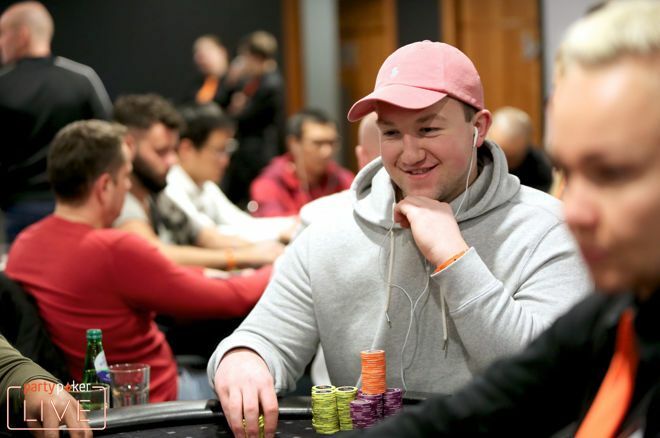 Taylor cashed in the WSOP-C UK Colossus event earlier this week, falling in 28th place for £2,900 and will be hopeful of continuing that form in the Main Event. Taylor bagged up 2,721,000 chips at the close of play, over 1.1 million more than second-placed Andrew Hulme who returns to the fray with 1,578,000 chips. Other players who finished Day 2 with a seven-figure stack include Ben Farrell (1,200,000), Eirimas Livonas (1,069,000) and Richard Trigg (1,048,000). Also in contention are the likes of Stuart Kinghorn (938,000), Jono Beck (777,000), Orpen Kisacikoglu (644,000), Richard Kellett (506,000), partypoker President John Duthie (488,000), Sam Grafton (466,000), recent addition to the PokerStars Team Pro roster Kalidou Sow (425,000), Tim Chung (392,000), Fraser McIntyre (354,000), Tom Hall (317,000) and Jeff Kimber (270,000). Play resumes at midday on Apr. 13 alongside Day 1A of the £330 buy-in £200,000 guaranteed Closer. Dusk Till Dawn will be even busier during the afternoon as the final day of the £200,000 guaranteed Monster Stack commences at 2:00 p.m., Day 1B of the Closer starts at 5:00 p.m. along with Day 1 of the £2,200 High Roller that has £200,000 guaranteed. A turbo six-max Closer Day 1C shuffles up and deals at 10:00 p.m.